If you’re looking for a reasonably priced video doorbell with a ton of features, you’ll want to consider this one from Ring. It’s one of the best brands in the business and they have a ton of satisfied customers. Read our buying guide packed with information to help you decide if it’s right for you. 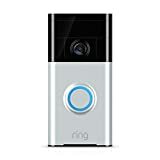 The Ring Wi-Fi Enabled Video Doorbell is yet another top-of-the-line security system on Amazon today. It has impressive features that provide full security in many households. Parents will have peace of mind all day while they are out to work. And during the night, the whole family will be worry-free because they will know ahead if something strange is going on outside. They will be alerted if a thief is trying to enter their house. The Ring Wi-Fi Enabled Video Doorbell is not a cheap device one can buy on bargain. In fact, it is a little bit more expensive than the other security devices available in the market. However, if one discovers the things this security doorbell can do, he will realize it is worth the money. It may be expensive for some, but many households trust this product and highly recommend it. And if you want to record anything, you’ll need to get the paid cloud storage option. It’s reasonably priced, but still adds to the expense of this home security device. The good thing about the Ring Wi-Fi Enabled Video Doorbell is that, it is compatible with any device. The user needs not go out anymore and face his visitors if he doesn’t feel like it. He can just see and talk to them via his tablet or mobile phone and the Ring app. As far as the Ring app goes, it’s a nice piece of software that it very easy to use and is relatively free of bugs, unlike some of the other devices on the market. This is a great must-have too, for people with disability or those having a hard time walking from inside their house to the doorstep. They can just interact with the people knocking at their door through the device. As long as there is Internet and WiFi connection, this innovative security gadget works efficiently. One of the best things, in theory is that you can get alerts and a photo to your Smartphone when motion is detected outside your door. However, many of the negative reviews on Amazon mentioned that this didn’t really work that well. It’s either too sensitive and activates for cars passing by on the street, is delayed and captures backsides as people are walking away, or just failed to trigger at all. If you want to compare the best in home protection and security for smart doorbells, be sure to check out the chart below. Or, take a look at our article, Top 5 Peephole Door Cameras. What’s Included with the Ring Smart Doorbell? Ring Smart Doorbell: What’s in the Box? Are you not the ‘entertainer’ type of person but there are days when you cannot avoid visitors? If you want to scrutinize first the people visiting you before inviting them to get in, invest in a high-quality doorbell camera. The Ring Wi-Fi Enabled Video Doorbell is undoubtedly worth spending for. If you review the features of this Amazon favorite, you’ll realize that one-time spending is worth it especially if it means to save the life of your loved ones. There’s one special feature you’ll definitely love about this security gadget. It functions efficiently with dual power connections. This video doorbell runs on a built-in battery you can recharge or the doorbell wiring that already exists wherever you intend to install it. The Ring Wi-Fi Smart Doorbell is perfect for solo-living, too. An individual who’s doing an important errand inside the house and cannot just go out to attend to visitors will find this product very helpful. Since this camera doorbell allows the user to see ahead and speak to the people at his doorstep remotely, no extra efforts needed here. If you have a hard time getting around and your front entrance is down the stairs from your main living space, this could be exactly what you need. What are your thoughts about this popular video door viewer? Leave a comment below and let us know what you think. Also be sure to give this a share on Facebook, Twitter, or Pinterest.